Nottinghamshire captain and man-of-the-match Steven Mullaney promised his side could still improve after a thrilling come-from-behind win over Lancashire at Emirates Old Trafford during the opening night of their defence of the Royal London one-day Cup. The Outlaws successfully defended a target of 319 as the Red Rose county slipped from 245 for three after 40 overs, when it looked like they would secure their record chase, to finish on 309 for nine. After his side’s nine-run win, Mullaney, who struck 70 from 59 balls, said: “I’m over the moon to get off with a win, but we still have a lot to improve on. That’s a good thing - if we can get two points and still improve on a lot of things. “We tried to get them above (needing) eight an over and back Harry (Gurney), Jake (Ball) and Luke (Fletcher) at the end with our death bowling. “If we can get it up there and make the batsmen take a risk, we feel like we’re in the game, especially on a wicket that was deteriorating. “Jake, Harry and Luke have played a lot of cricket now, and myself and Samit (Patel) have as well. Billy Root also got an important wicket of Jordan Clark. “It’s good to have new faces in as well. It was nice to see Chris Nash get some runs after a tricky start in the Championship. “To get up to 320, we were made up at half-time. “We said anything above 300 we’d have been happy with, but it’s a good job we got those extra 18. After electing to bat, Mullaney crunched his whirlwind 70 during the final 20 overs of an innings that started well, stuttered and was revived fiercely on a superb surface. Chris Nash and New Zealand overseas Ross Taylor hit 52 and 58, with the 84 for the fifth wicket in 12.2 overs shared between Taylor and Mullaney sparking a late flood of runs after 128 for one had become 164 for four inside 32 overs. While the last 10 overs yielded 106 runs, Lancashire leg-spinner Matt Parkinson claimed all of his five wickets inside the last seven on the way to career best figures of five for 68 on his Red Rose List A debut. He had Taylor caught at long-off and Mullaney, who faced 54 balls, caught at cover. In reply, Lancashire’s Keaton Jennings opened with an excellent 136 after claiming a career best two-wicket haul. Captain Liam Livingstone and Dane Vilas attacked for 33 and 41 respectively, taking all the pressure off left-handed Jennings in the chase. He shared half-century stands with both of them (70 with Livingstone and 63 with Vilas) as the hosts reached the 30-over mark, ideally placed at 179 for three. The former Durham man reached his fourth career List A off 98 balls with nine fours just under six overs later, becoming the fourth player to score a century on Lancashire List A debut. Jennings added 87 for the fourth wicket with Steven Croft (33) before the score fell to 245 for four in the 41st with the departure of the latter to Samit Patel. At that stage, Notts were still behind. But England hopeful Jennings will be frustrated that, despite a third successive century in all forms, he fell in the 47th over to leave the score at 288 for six. Left-arm seamer Gurney, who finished with three for 61, had him caught at square-leg pulling before Jake Ball struck twice in the next over. That meant 16 were needed off the last, bowled by Ball, with only last pair Arron Lilley and Parkinson to get them. Lancashire captain Liam Livingstone said: “I’m delighted for Keaton and the way he played, but that’s the way one-day cricket goes. We’d have backed ourselves with 10 overs left, but it’s disappointing. 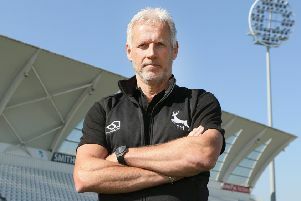 “The Notts bowlers bowled really well, and we knew the pitch was going to get tougher and tougher. “The way we stacked our side with spinners, you could tell we thought the pitch was going to slow up. “Fair play to Notts, they bowled well. “The way Harry (Gurney) bowled his change-ups, his cutters into the pitch worked really well. We could have done that better in the first innings, but it’s the first game of the tournament and we have a lot of positives to take forward. “We could have been a little bit better in the field here and there. If you keep them under 300, we win the game.